ACT Alliance is joining with UNICEF and other partners to launch a programme called Refugees Welcome. This programme is an opportunity for ACT and its members to stand in solidarity with the world’s 65 million displaced persons, over half of whom are children. Many ACT members have been responding to the needs of refugees for a very long time, and others are just beginning to. 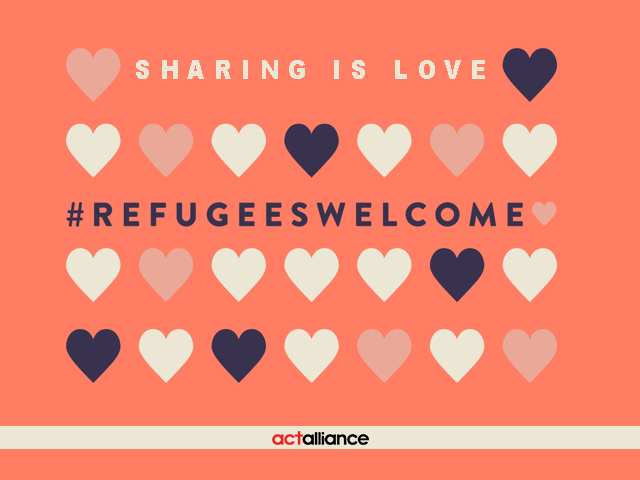 As part of a wider and longer-term strategy to seek ways to demonstrate solidarity with refugees, Refugees Welcome is using Valentine’s Day as a launch moment. The world is witnessing the highest levels of displacement it has ever seen. For many of us, these statistics remain just that – numbers that we are powerless to change. But together we can welcome refugees – one family at a time – by giving them a place at the table. The idea is to rebrand Valentine’s Day, from a day of romantic love to one focused on empathy, friendship and inclusion. A concrete way to show love for neighbours and new community members is to invite a refugee family for a meal. Our Christian heritage demonstrates time and again how sharing a meal is a key to building community. Adjusting to a new country and lifestyle can be challenging, and many communities are looking for ways to show their support. This simple act of hospitality goes a long way to helping refugees feel welcome in their new homes. Each country has its own history of showing support for refugees, and this initiative hopes to build on efforts that are already underway. ACT is encouraging its member churches and agencies to join this programme, to invite refugees to share meals in communities around the world. This simple hospitality is a concrete example that will show louder than words that refugees are welcome. Through this unifying, unbranded campaign, ACT members can elevate the profile of these welcome dinners, helping to make the connections between refugee and host. To accompany Refugees Welcome, we are finalizing a toolkit to help organizations and influencers with messaging. In the meantime, we are sharing images and descriptions of the campaign here. – SHARE: upload photos of your dinners onto your organizational and personal social channels with the hashtag #RefugeesWelcome. Those groups who are aiding refugees in other ways are also encouraged to share these images under the campaign hashtag. In the coming days, we will share the Refugees Welcome toolkit with you, which contains messaging and information on hosting dinners. And later this week, the website, www.refugeeswelcometodinner.com, will go live. While this initiative is being launched on Valentine’s Day, it has no expiration date. Sitting down at the table is just the beginning. The idea is for supporters to take concrete action with and on behalf of their new neighbors following the meal, and to establish meaningful connections. The possibilities are endless. This Valentine’s Day, we hope you’ll help us spread the love.